My husband and I enjoyed this cruise very much. Food and service was very good. The ship is pretty large (about 2,600 passengers I think on our cruise) so getting off at ports, especially where there is a tender, takes a while. Also often had to hunt for a seat at the Horizon Court Buffet but the formal dining rooms are a good alternative. The ship is fairly old and will probably be in need of a refit before too long but is in acceptable condition at the moment. Our biggest disappointment was not being able to cruise in Fiordland as the weather forecast wasn&apos;t very good in spite of being fine in Dunedin when the announcement was made the day before. Instead we headed back to Melbourne at a slower speed to arrive at the scheduled time. Apparently this cancellation is not unusual. We did get a refund of $25 each for "port tax". Our stop at Gisborne was also cancelled as it was a bit rough for the tenders - $10 port tax refund each. The other disappointment was the price of drinks which we thought were exorbitant at $15 glass for the only Shiraz available (about $55 a bottle I think) and $12 glass for a Sav Blanc. Because of this we purchased wine ashore (never had any comments when our hand baggage was x-rayed on returning to the ship) and paid $15 corkage in the dining room or drank it in the cabin. I suspect they may have increased the price of drinks dramatically when they cut out the gratuities on Australian/NZ cruises. 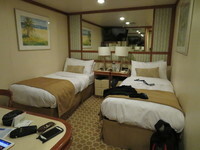 We were 3 days short of qualifying for Platinum status at the start of the cruise so were very pleasantly surprised to be upgraded to Platinum on embarkation. It was great having 250 minutes each of free internet (the only real benefit to us of having Platinum status). The cruise was pretty much as we expected and was excellent value as it included our air fares from Perth to Melbourne and return. I would recommend this cruise if you want a quick taste of New Zealand and enjoy the shipboard experience. My husband and I enjoyed this cruise very much. Food and service was very good. The ship is pretty large (about 2,600 passengers I think on our cruise) so getting off at ports, especially where there is a tender, takes a while. Also often had to hunt for a seat at the Horizon Court Buffet but the formal dining rooms are a good alternative. The ship is fairly old and will probably be in need of a refit before too long but is in acceptable condition at the moment. Our biggest disappointment was not being able to cruise in Fiordland as the weather forecast wasn&apos;t very good in spite of being fine in Dunedin when the announcement was made the day before. Instead we headed back to Melbourne at a slower speed to arrive at the scheduled time. Apparently this cancellation is not unusual. We did get a refund of $25 each for "port tax". Our stop at Gisborne was also cancelled as it was a bit rough for the tenders - $10 port tax refund each. The other disappointment was the price of drinks which we thought were exorbitant at $15 glass for the only Shiraz available (about $55 a bottle I think) and $12 glass for a Sav Blanc. Because of this we purchased wine ashore (never had any comments when our hand baggage was x-rayed on returning to the ship) and paid $15 corkage in the dining room or drank it in the cabin. I suspect they may have increased the price of drinks dramatically when they cut out the gratuities on Australian/NZ cruises. We were 3 days short of qualifying for Platinum status at the start of the cruise so were very pleasantly surprised to be upgraded to Platinum on embarkation. It was great having 250 minutes each of free internet (the only real benefit to us of having Platinum status). The cruise was pretty much as we expected and was excellent value as it included our air fares from Perth to Melbourne and return. I would recommend this cruise if you want a quick taste of New Zealand and enjoy the shipboard experience.